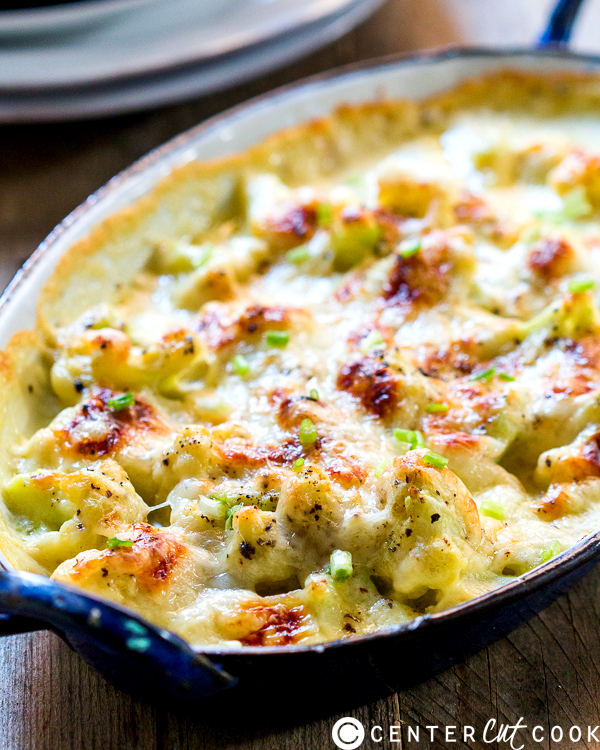 A cheesy garlic cauliflower gratin never fails to impress people at the thanksgiving table. Because it’s low carb, but oodles of taste plus who can say no to cauliflower in oodles of creamy cheese sauce. 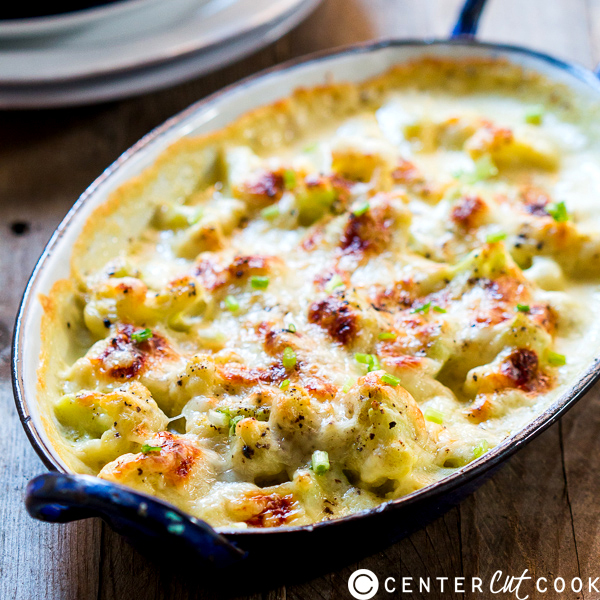 This cheesy garlic cauliflower gratin is a regular at the thanksgiving dinner table. Because it’s like good old mac and cheese, but without all the carb. Plus garlic gives it a wonderful subtle flavour that takes it up a notch or two. My husband actually hates cauliflower and this is the only time he agrees to eat it. With a lot of enthusiasm in fact! This dish is really easy to make, and can be made with other fall vegetables too, but I like cauliflower best with sweet potato coming a close second. I like to quickly blanch the cauliflower florets before pouring the sauce over it so that it cooks faster, and the whole dish is ready in under 40 minutes. While it’s a great side dish for thanksgiving, on other days you can also make a larger batch and serve it as a main with a big salad and some rustic bread. If you want to be more stylish with this dish, dish out individual servings in smaller ramekins or cast iron pans. Feel free to jazz it up with more add ins like bacon, sage or broccoli. Pre -heat oven to 400 degrees. Bring a pot of water to boil, add a tablespoon of salt and the cauliflower florets to it. Boil for a minute, drain and set aside. In another pan, heat butter and add garlic. Add the flour and cook for a minute. Reduce the flame, and start adding milk while whisking continuously. Keep whisking till the sauce starts to thicken. Simmer for three to five minutes and mix in cream cheese, nutmeg powder, salt and pepper. Transfer cauliflower to a baking dish and pour the sauce over it. Top with grated cheddar and bake for 20 minutes till the top is golden brown.